Recently, Galliani spoke to the importance of Milan’s Youth. In addition to a commitment to the health and well being of children all over the world through the Milan Junior Project, which promotes health and activity and teaches football to children in camps throughout the world, Milan continue to have an excellent youth program for finding and training young footballers. The problem is, Milan hold on to Milan Youth players like Bonera and Antonini, and sell players like Matri and Miccoli. But there have been some brilliant players in the past that Milan trained and kept, like Baresi, Maldini, Albertini, and Costacurta, so I have faith that there will be again. For example, that De Sciglio kid… he seems kinda good, right? Maybe this financial downturn is just what Milan executives needed to see that the goldmine they have in their youth teams right now is worth more to them in the red and black than in their pocket books. Do you believe? I have always wondered exactly how the hierarchy of the youth teams works. So I did a little research (by “little” I mean the very, very least I could get away with, so there should be errors!) Let’s start with the Primavera. They are the U-20 team that trains at Milanello with the First Team. They are currently coached by Coach Aldo Dolcetti, but are also at the disposal of Allegri, as we have seen players called up many times throughout the season. Their league is called the Campionato Nazionale Primavera, which consists of Primavera teams from Serie A, B, and Lega Pro (formerly Serie C,) where they play throughout the season for a Scudetto. They also take part in tournaments such as the Viareggio tournament, which is an international tournament for youth teams. Whereas many Serie A clubs have their Primavera take part in the NextGen Tournament, a European competition, Milan have not been able to participate due to some sort of sponsorship conflicts. All of the other youth teams train at the Vismara Sporting Center in Milan. Each team is made up from players of a specific age group: Beretti are the U18 players, Allievi Nazionali (“national students) are U-17, Allievi Regionali “regional students” are the U-16 players and Giovanissimi Nazionali “young nationals” are the U-15 players. The U-14 and U-13 teams are called the Giovanissimi Regionali “young regionals” A & B teams respectively. Then the Esordienti (“newcomers”) teams are labeled by the year of birth for the various players, for example Esordienti 2000 features U-12 players, the U-11 players are Esordienti 2001. The youngest squads are the Pulcini (“chicks”) 2002 & 2003, the U-10 and U-9 teams respectively. Daniel and Christian... legendary genes... will Milan cash in or keep them? There are a couple of players in these younger teams that most Milan fans are eagerly awaiting. Christian Maldini, who just turned 16, has been playing as a defender on the Allievi Regionali team. (you can follow him on Twitter @ChrisMaldini) The other player, Daniel Maldini is most famous for tackling Clarence Seedorf, when the young Maldini was only 5 years old. Now, at the age of 10, he plays forward for the Esordienti 2001 or U10 team. (He is also on Twitter, @DMaldini10). So if nothing else gives you faith in our youth system, there are two reasons to believe. More reasons to believe include some of the names involved in developing our Milan youth. Notable former Primavera coaches include Fabio Capello, Franco Baresi, and Mauro Tassoti. Filippo Galli, himself a former Primavera coach, oversees the youth system. And there are even currently a couple of goalkeeping coaches that may seem familiar: Beniamino Abate, father of Ignazio Abate, who works with the Primavera keepers, and the newly appointed Flavio Roma, who is set to join with the Giovanissimi Nazionali keepers. Galliani is still trying to convince Pippo to coach one of the youth teams, too. So Milan are definitely a family, a family of champions, and they seem intent on continuing these traditions. 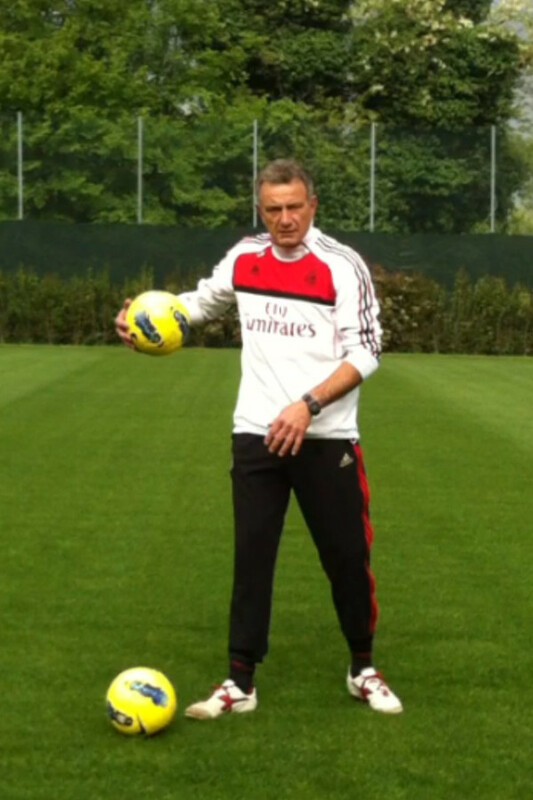 Milan invests a lot of money into the training of these youngsters, as well as into their health and well-being. So I suppose they feel justified cashing in on them as they are ready to join the ranks of Serie A. Players like Paloschi, Merkel and Strasser all showed great promise as Primavera players, and looked set for long careers with Milan after making appearances for Milan and/or being loaned out to other teams for experience are now being sold or used as pawns for other players. And then Milan shop for their “champions” elsewhere, paying so much more for players who aren’t always proven, either. Probably not the greatest business model. A very poignant reminder of this policy was when Galliani introduced Gabriel, our new 19 year-old third keeper while discussing the importance of Milan youth, while Piscitelli’s first team dreams came crashing down. (Piscitelli was apparently good enough to make the First Team bench for much of the season while Flavio Roma was out injured.) It seems that even if we believe, Milan executives still need to put their money where their mouths are. Our imported new third keeper... worth pushing Milan Youth aside? But still, I can’t help but believe. There are a lot of great players coming up through the youth teams. This year the Primavera went all the way to the semifinals before being sent home. With fabulous performances by Ganz (whose father also played for Milan,) Comi, Valoti, Cristante, Ely, and more, some of whom made the bench or even saw playing time for the First Team this season, too. Will they be great players to wear the Rossoneri jersey for the First Team one day? There are two ways to find out: send them off to other clubs, where they may come back to haunt you, or keep the faith and bring them into the Milan fold. 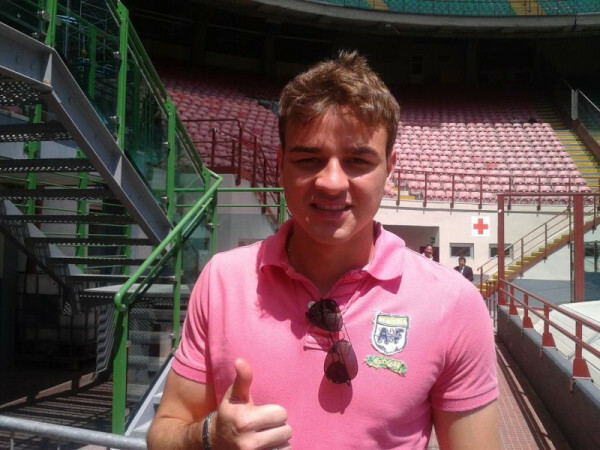 Obviously, not every Primavera will be lucky enough to make the First Team someday, but choosing the more talented players, and letting players like Bonera and Antonini maybe “shine” for other teams seems like it would work out better for us. Meanwhile, our U-15 players are still going, as the Giovanissimi Nazionali beat Torino yesterday, 2-1, with goals by Vassallo and Garofoli. They will face Juve in the semifinal of their championship tomorrow, while Napoli and Inter play the other semifinal. Best of luck to them! Clearly they are very competitive, and who knows what future Milan star dwells amongst them? I Giovanissimi Nazionale prepare for their quarterfinal match this past week. We may never know, unless we take a chance. Believe in our youth, give them a chance. If they turn out like Bonera and Antonini, with an infinite learning curve and only a few good performances, then we can give up on them and sell them to another team. But maybe the next Baresi or Costacurta or Albertini are amongst the youth ranks. We already know the next Maldinis are. With a little more attention given to the treasures already under our noses, we can save money on excessive scouting and purchasing foreign players, and focus on developing the ones we already have. 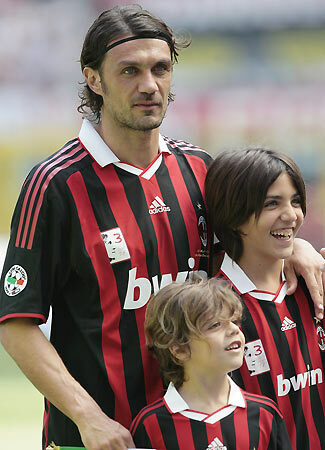 Wouldn’t it be great if the next generation of Milan legends are already wearing the red and black? It can be true… if we just believe. Correction: after this writing, there was a penalty to Inter's Giovanissimi Nazionali team which changed the seedings, so the match will actually be Milan vs. Inter tomorrow and it begins at 18:00 CEST, or 12noon EDT. Forza Milan! betrayal i believe maldini milan youth milanello primavera remember when I had a co-blogger?